An adult's average intake of protein is about 80 g per day; an additional 70 g enters the gut in digestive enzymes, shed intestinal cells and mucus secreted to protect the intestinal wall against digestive enzymes. Most of this protein is hydrolysed to amino acids and dipeptides in the intestinallumen, andn dipeptides are hydrolysed in the brush border of the mucosal cells. There is a faecal loss of protein and other nitrogenous compounds equivalent to about 10 g of protein per day. Some of this is indigestible dietary protein, some is mucin, the main protein of mucus, which is resistant to enzymic hydrolysis; much is bacterial protein. The absorbed amino acids are used for protein synthesis, to replace proteins that are constantly turning over; in a growing child, or an adult recoveruing from protein loss, there is also nett protein synthesis. Some of the amino acids released by catabolism of tissue proteins are re-utilised, but in general they are deaminated, and their carbon skeletons are used for gluconeogenesis or as metablic fuels. Similarly, newly absorbed amino acids in excess of the need for protein synthesis are deaminated, and their carbon skeletons used for gluconeogenesis or fatty acid synthesis. The urea formed from the amino groups of these amino acids is the main nitrogenous compound excreted in the urine. A relatively small proportion of the body's free amino acid pool is used for synthesis of a wide variety of other compounds, which are later metabolised to yield other nitrogenous compounds that are excreted mainly in the urine. It is relatively easy to measure total nitrogenous compounds in foods, urine and faeces, by means of the Kjeldahl reaction, which is a catalytic reduction in concentrated sulphuric acid of all nitrogenous compounds to ammonium sulphate. Alkalisation of the resultant reaction mixture permits distillation of the ammonia, which can then be determined by titration or other methods. Therefore it is relatively simple to determine the total dietary intake of nitrogenous compounds (mainly protein) and the total output of nitrogenous compounds (in urine, faeces, and perhaps also sweat and shed skin cells). 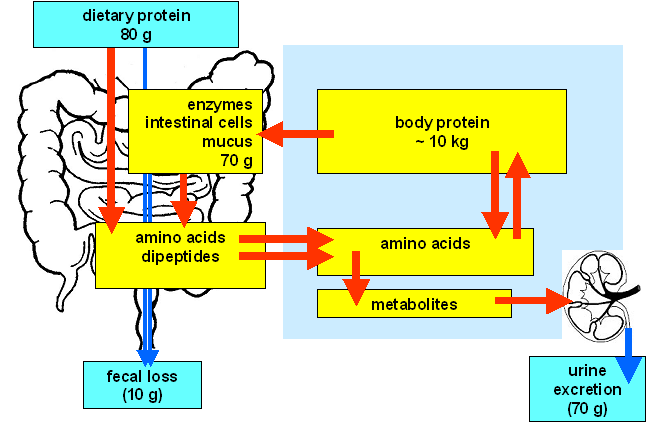 As shown in the diagram above, for an adult, in whom the total amount of protein in the body is not changing, output of nitrogen in urine and faeces is aproximatekly equal to dietary intake. This is N balance or N equilibrium - the difference between intake and output of nitrogenous compounds. There is no change in total body protein. This is the normal state in an adult. There is an increase in total body protein. This is the normal state in growth (including pregnancy), and in an adult recoveing from a loss of body protein in response to trauma or undernutrition. There is a nett loss of body protein. This is never normal, but reflects either a response to trauma or infection, or an intake that is inadequate to meet the need to replace tissue proteins that are turning over. To run the program, click the "Run" link. The program will then run in a separate window, and at any time you can minimise the program window to check the theory from this page. As you run the program, you are asked after each simulated experiment whether you wish to save the results to print out. If you save results, they are saved in a file called simout.txt in your temporary file area. When you close the program you are given the option of printing out the results you have chosen to save for printing.